The dying days of the Middle Ages and the dawn of the Renaissance brought with them the greatest geographical revolution in the history of mankind. The late fifteenth and early sixteenth century were the age of King João II, Portugal’s “Perfect Prince” and of his successor King Manuel I. In Spain, it was the age of King Ferdinand and Queen Isabella (the Catholic monarchs) and their successor, Emperor Charles V. It was in this period – during the forty years between the Portuguese voyages of 1480-1485 by Diogo Cao (to Africa beyond Guinea) and the Castilian voyage in 1519-1522 by the Portuguese Ferdinand Magellan (to the Pacific and around the globe) – that the major expeditions took place. Bartolomeu Dias sailed to the Cape of Good Hope, Christopher Columbus discovered unknown lands on the west, Paulo and Vasco da Gama reached the Indian Ocean and India itself, Amerigo Vespucci sailed to the New World giving his name to the lands discovered there. Thus, in the life of a single generation between 1480 and 1520, the majority of the great geographic discoveries and great intercontinental encounters between civilizations occurred. Cartography – “The Science of Princes” – reflected this extraordinary explosion of geographical and anthropological knowledge, exotically illustrated with luxurious and exuberant artistic illuminations. 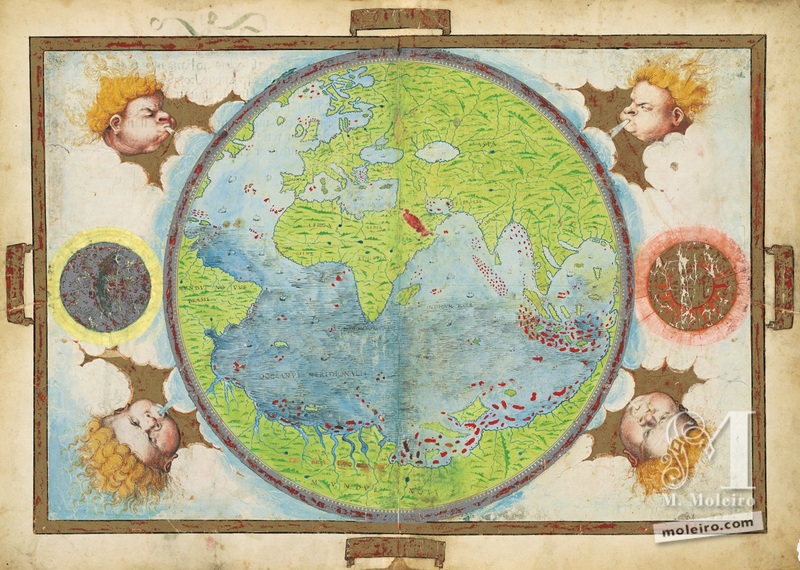 The most outstanding outcome of this process of renovation of the image of the world, in which art and science joined forces, is evident in the Portuguese atlas now housed in the Bibliothèque nationale de France in Paris, known as the Atlas Miller (1519), by the cartographers Lopo Homem, Pedro Reinel and Jorge Reinel and the miniaturist António de Holanda. This veritable masterpiece with its geographic innovations and sumptuous artwork portrays the forty years that changed the world on the eve of the first circumnavigation of the globe. When looking at the Atlas Miller original portolan charts and the mappamundi for the first time – or in an “almost-original” replica of the unparalleled quality produced by Moleiro Editor – the most outstanding aspect is their magnificent and luxurious artistic decoration. The sophistication and pictorial detail, the gilding and colours, not to mention the superb graphic quality, all shine through. From the organisation of the wind-roses, the scales and graduated meridians, the captions and titles, the iconography of the flags and other heraldic symbols through to the iconography of the naval architecture, the iconography of European and non-European cities, the anthropological iconography of peoples from outside Europe, and the iconography of the exotic flora and fauna, the decoration is truly fitting for a book of hours, although it appears in an atlas. The centre of the parchment sheet is occupied by the circular Atlas Miller mappamundi, as decorative as it is crude and measuring 330 mm in diameter. It was drawn and coloured inside a rectangular frame whose four corners hold an equal number of fascinating wind-heads that seem to be blowing from the “Four Corners of the Earth”. The same frame also holds the sun and the moon, one on each side. The initial impression when looking at the mappamundi is that it is crudely misshapen, as if shifts the Old World continents of Europe, Asia and Africa to the north, and shows the vast southern area occupied by a vast sea where the Atlantic and the Indian Ocean meet and mingle. This is then surrounded by a huge and fantastical southern land-mass that stretches from west to east, linking the New World that the Portuguese and Castilians had recently discovered (1492-1500) to the lands of Asia and the Southeast Asian islands that the Portuguese had reached and were settling (1497-1519). The second sensation felt when looking at the mappamundi is that within the general geographical concepts, it is strange that the seas are all surrounded, enveloped even, by the continents. This transforms them collectively into a sort of enormous lake with several branches that are all encircled by land. Thus, the land surrounds the seas rather than the other way round. It is hard to understand why this strange vision was used or reused at this time. The concept found in the Atlas Miller mappamundi, while slightly updated and made compatible with the discoveries of the seas and the continents between 1482 and 1519, is simply an attempt to maintain the old concept established by Ptolemy even after the discoveries of the New World in the west and the sea route to India. The former belief was that all the seas formed a stagnon, meaning that they all formed an inland sea or “mediterranean”, and that the continental lands extended in all or almost all directions so as to leave the seas in the middle. This old concept, expressed by Greek, Hellenistic and supposedly even Roman authors was a global vision of the world that spread in late Antiquity, especially through Ptolemy’s thinking. It later influenced all the cultural circles that this thinking reached, including – though a long extension in time and space – those of western Latin Christianity. Gradually, throughout the 15th century and in the early 16th, the codices of Geographia started being translated and copied, then accompanied with maps, and finally printed. This leads to a paradox, or at least to an apparent paradox. How could the atlas from circa 1519, which demonstrated the radical novelty and sensational modernity of Portuguese cartography better than any other work, also show the influence of Ptolemaic geography and even attempt to reconcile the two? The said novelty and modernity came from the new technical processes related to latitude and astronomical navigation, and above all from the extraordinarily broad geographical scope of the new lands shown. At the time, Ptolemaic geography was being dismantled and discredited by the Portuguese geographical discoveries. So, how could such a paradox exist? It seems like, the concept of the stagnon and the Atlas Miller mappamundi suited the Portuguese around 1519 as it encouraged the belief that it was impossible to sail across from west to east on the other side of the planet and to achieve what Columbus had tried to do and Magellan later did. Therefore, the Portuguese agreed and disseminated that idea in an ostensive, luxuriously illustrated, official and institutionalised way throughout the reign of King Manuel, and insisted on doing so in 1519, close to the end of the reign. In geographical (or rather geo-strategic and geopolitical) terms, this is the secret of the Atlas Miller: it tries to counter the idea that the world could be circumnavigated, to prevent the project that would be achieved immediately after or even at the same time by Magellan. In other words, the Atlas Miller and its mappamundi are the graphic form of the Portuguese geo-strategic vision of the world, one that was designed to counter the Castilian vision. The Portuguese were the great creators of hydrographic portolan charts and had discovered the world through the influence of the last great medieval circular mappamundi. They had made their discoveries of the world without Ptolemy – even going against Ptolemaic thinking! Then in 1519, they proved to be heavily influenced by Ptolemaic geography and aesthetics, demonstrating this influence in the planisphere (a sort of Ptolemaic mappamundi) that was the frontispiece to a magnificent atlas that brought together the finest of the new portolan charts that showed the newly-discovered lands. There are three fundamental questions here. First, why did the Portuguese evolve (or rather regress) in their geographical vision of the world? Secondly, did this transformation truly take place in the heart of Portuguese government circles or did they decide to adopt this new geographical doctrine and present it openly in the Atlas Miller for geo-strategic and geopolitical reasons? Finally, did this suit Portugal in the early 16th century, when the way to India via the Cape of Good Hope route was already open and internationally protected for Portugal by the diplomatic and political clauses in the Treaty of Tordesillas, which were accepted and respected by Portugal’s great rivals in Castile? To some extent, the first theory is understandable. As the Portuguese had sailed and explored the seas more than any other nation, they may have triumphantly and naively felt that they knew all the seas and that they were smaller than had previously been thought (and indeed are). Perhaps they felt that the seas had become too small. Yet the true reason must fundamentally have been to use the Atlas Miller as a tool for geo-strategic, geopolitical and diplomatic misinformation, trying to make the Castilians – esteemed neighbours, rival siblings and cordial competitors – believe two things. First, they tried to make the Castilians believe that it was more than very difficult to reach the Orient via the western route. The Castilians had known this since Columbus’ time, but were still trying to get there, showing increasing insistence and stubbornness and using Portuguese navigators such as João Dias de Solis in the Gulf of Mexico (1508-1509) and the River Plate (1515-1516). The Portuguese worked hard to make the Castilians think this plan was simply impossible because the New World was a continent, because the land on the planet was too big and continuous, and because the seas too small and closed. Secondly, they tried to make the Castilians believe that the Cape of Good Hope route to India – the Portuguese southeast African route that was diplomatically safeguarded by the Luso-Castilian Treaty of Tordesillas and was therefore unchallengeable by Portugal’s neighbours – was a very easy one. It was short – very short in fact, since Africa itself was also small – and India was just around the corner after rounding the Cape of Good Hope. Thus, the subject was closed and India was in safe hands. Consequently, it would be better if Charles V and the Castilians gave up and concentrated on marrying their princesses – one after another – to the old “King of Pepper” and Master of the Cape Route. This is the theory to explain the first and most important question of what the Atlas Miller is, why it was made in that form and for whom. The vellum sheets with the regional charts and the vellum sheet with the mappamundi were produced under the supervision of cartographer-cosmographer Lopo Homem, and all decorated by royal servant and Flemish miniaturist António de Holanda. As such, they formed a tool for misinformation that was deliberately ordered by the Portuguese crown and expressed the Portuguese counterstrategy regarding the Castilian strategy in 1519. The Atlas Miller, produced in 1519 and probably never actually used, was a graphic form of the last Portuguese intent to counter the “Columbus Plan” for the westward Atlantic route, a Portuguese plan that was determinedly adopted and implemented by the Castilians. This was an excerpt from the Atlas Miller commentary volume by Alfredo Pinheiro Marques, Director of the Centro de Estudos do Mar-CEMAR at the University of Coimbra.